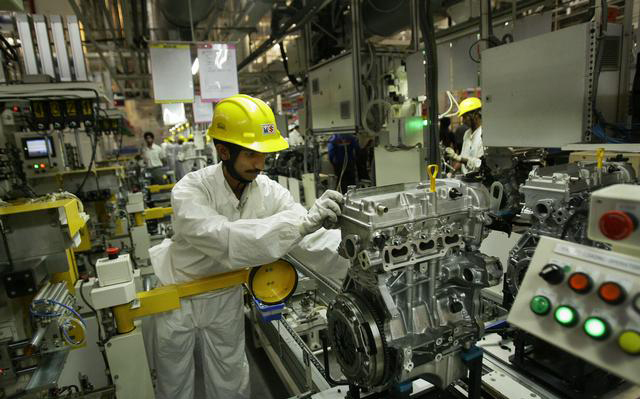 Maruti Suzuki recently announced that they would significantly reduce their diesel engine exports to Hungary, as they plan to concentrate more on the Indian auto market. Maruti has been facing a lot of competition from the new entrants in the market, like Volkswagen Polo, Toyota Liva and the Ford Figo. They announced that they would be increasing the production of their Swift to 18,000 per month, for reducing the current wait period for the car. The soon to launch Brio from Honda, will also increase the competition for the Swift. The company’s managing executive officer of sales and marketing, Mayank Pareek, was quoted as saying that they are significantly decreasing the export of diesel engines for catering the demand in the Indian auto market. In the following six months, the company will begin decreasing the exports in negligible levels. The diesel engine facility of the company in Manesar manufactures around 2.8 lakh engines per annum, however it needs around 4 lakh units to sufficiently meet the Indian market needs. Pareek added that the additional engines that they will get after decreasing their exports, will be used for the Swift car in India. As the petrol prices soar higher, the demand for cars powered by diesel engines has also increased. Many companies that offer both diesel and petrol versions of a car, have been witnessing a higher demand for the diesel variants, by as much as 70:30. The company made an investment of around INR 550 crores for developing the new Swift. This car is to be produced on a whole new platform. He added that they will increase the Swift’s production to around 17,000 to 18,000 units per month, from the current 10,000 to 11,000 units. As a result of this, the wait period will be decreased from the current 3 to 4 months, to 2 to 3 months. He also said regarding the sales that they expect it to be about 18,000 units per month; however they are trying to aim for 20,000 units per month. Maruti has also received record breaking bookings for 30,000 units till now. He added that since the launch of the car back in 2005, the car has managed to sell around 6 lakh units. The new 2011 Swift will be equipped with a 1.3l diesel engine and a 1.2l petrol engine. While Pareek did not reveal the pricing of the car, as he announced that the car would be official launched on August 17, according to sources, the car is likely to be priced in excess of INR 30,000 compared to the existing models that have a price ranging between INR 4.09 lakhs to INR 5.38 lakhs, according to ex-showroom prices in Delhi. This car will be manufactured at the Manesar facility of the company, where the unit B will begin operations this September by producing the new Maruti Suzuki Swift.